The PSORT consortium is directed by Christopher Griffiths OBE, Professor of Dermatology at The University of Manchester and Consultant Dermatologist at Salford Royal NHS Foundation Trust. In his role as Director, Professor Griffiths is supported by several key decision making committees. An Independent Advisory Board of international experts in disciplines critical to PSORT has responsibility for monitoring and overseeing the overall progress of PSORT’s programme of research. 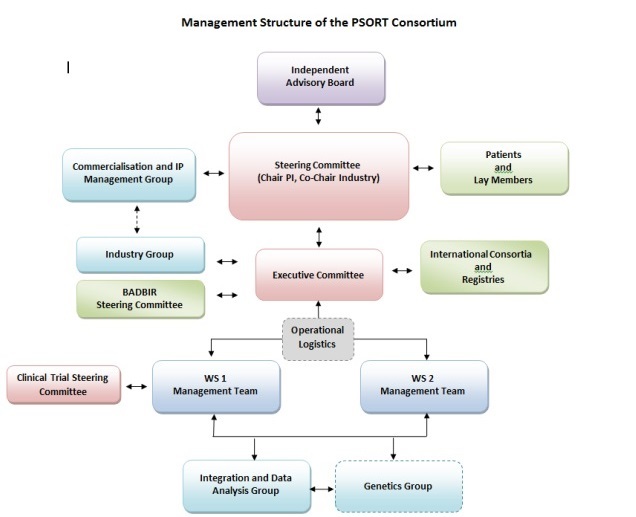 Central to PSORT is the project Steering Committee which has overall governance responsibility and accountability to the Independent Advisory Board (IAB) and funding body, the Medical Research Council (MRC). The Steering Committee meets quarterly as a group and annually with the IAB. Through Work Strand (WS) Leads, the WS Management Teams are accountable to the Executive Committee whose function ensures WS delivery and overall performance. Project Officers support each WS whilst a Programme Manager supports the Steering and Executive Committees.